Beautiful scenery, but more hilly terrain today. In my lower gears multiple times slowly climbing. Mostly reddish rocks, but also some nice black basalt outcroppings. Crowd of eight or nine people at the roadhouse at 6 am. The Greyhound coach (bus) had arrived from Townsville for an hour stop over. It takes nine hours to ride where I pedaled six days. Struck up a conversation with a woman with backpack who was reading her Lonely Planet guide and on here way to Normantown. Crossed the Cloncurry River and started the first of many gradual climbs. First a fire burn area, but then a mixture of low shrubs, occasional trees and grasses. Very few cattle. Lots of interesting rock formations and small hills that the road wound itself around. A higher than average density of road kill kangaroos and three or four live ones seen today. After 43 km there was a small marker for the site of the Burke and Wills expedition in January 1861. They were first men to cross Australia from south to north, though I believe died in the bungled expedition. In January, it would have been the wet season with creeks full. Today, all creeks were dry. In multiple places road work was underway to upgrade these crossings. At 59 km there was a nice rest area, though signs said you couldn't drink the water. Two different caravaners offered to fill my bottles, though I had brought 5 liters and thus had enough. There are enough people like this along these parts if one really gets into trouble. A slow climb the next 10 km, then some nice descents. Yeah! More bouncing terrain before another climb most of the last 15 km to Mount Isa. The skyline of Mount Isa is dominated by the Mount Isa Mine. Worlds biggest single producer of silver and lead and in the top ten for zinc and copper. Supposed to be 20,000 residents, though didn't feel that large. I did have the first traffic lights since Townsville almost 900 km before. Bought a ticket for a mine tour and decided to take a rest day tomorrow. The next 645 km will have only points to stay in motels and very limited water, so I'll be camping and watching things closely. 118 km today, 8665 km cumulative. Rest day in Mount Isa. I stocked up on provisions and saw local sights. The mine is 1.5 km by 5 km and is dug to a depth of 1800 meters. All mining is underground and 800 miners are continuously underground in 12 hour shifts. The mine and contracts they outsource, employ 5000 people. There is a copper smelter and copper leaves Mount Isa in 360 kg plates that are 98.5% pure. There is a lead smelter and the lead/silver mixture is cast into 4 tonne blocks that are 99.6% pure. Zinc leaves in covered railroad cars for the smelter in Townsville. A byproduct of copper smelting is 3000 tonnes/day of sulphuric acid that I saw leaving on railroad cars. It is used in a phosphate mine in the area. I have already seen road trains carrying copper ore from Cloncurry area, which is why they were upgrading the creek crossings. I will also anticipate seeing lead/zinc/silver ores coming from further west. Excess tailings from the mine are put back underground. They are mixed with concrete brought by train from the Gladstone area. Overall, the mine tour showed well how ores were first crushed and mechanically separated, before being chemically separated and sent to the smelters. The scale of everything was impressive. I also visited the Riversleigh Fossil museum. On the Gregory River in Northwest Queensland, a large number of mammals from the past 30 million years have been captured in limestone. Shows an interesting history of these animals. I saw the Frank Aston Underground Museum which was an eclectic mix of farm machinery, mining equipment, aboriginal displays and early 1900s electro-mechanical devices. Most interesting were some of the mining displays that had been placed in underground tunnels. Mount Isa is supposed to be a melting pot of 50 different nationalities and one sees a variety of faces. Town newspapers are upbeat about prospects of a natural gas pipeline from the Timor Sea off Darwin being routed through Mount Isa. Also possibilities of the Adelaide to Darwin railroad being completed and having a connection to Mount Isa. Definitely gives a feeling of a frontier, but resource rich town. This is reinforced by the large smokestacks and mine looming over the town. 0 km today, 8665 km cumulative. Today I spent all day cycling across town. 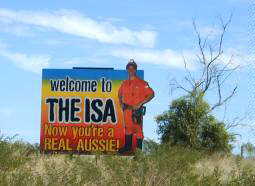 Camooweal, population 300 and gateway to the Northern Territory, is administered by the Mount Isa City Council. So, one could argue that I spent all day riding down a long main street across town. My original plan was to ride to a rest area at 118 km and depending on the amenities and the time; either stop or continue to sundown. I didn't expect any water until Camooweal and thus topped everything off...ten liters split between nine bottles on the bike and a three liter Camelbak on my back. Expected that to last me for 188km of riding and an overnight. Over breakfast at McDonalds, met two couples who were driving to Alice Springs (~1100km) today and had come from Townsville (~900km) yesterday. 6:30am was almost too dark, but there were street lights through town. Went past the mine, the airport and then no more town for a while. Low hills along the way, but flatter terrain than before. Also lost about 250m of elevation today. Shrubs and some trees along the way with occasional open spaces. Saw an increasing amount of termite mounds today. Passed the Hilton mine and the George Fisher mine before leaving mining areas for now. At 54 km was a rest area describing construction of the road. This road was quickly built and sealed during the Second World War by Americans and Australians. It was fully expected that the Japanese would invade Northern Australia and Darwin was bombed. This original road was replaced in 1994 and numerous small plaques along the route marked various camps. Despite the extra weight and a range of hills at 30 km, the bicycle rode well and I made good time. I reached the halfway point before noon and was at the 118 km rest area shortly past 1pm. No water. No toilet. Hot and dusty. Didn't look particularly inviting to hang out in my tent all afternoon, and only 70 km to Camooweal, so continued on to find something better down the road. Initially the road had been wide and smooth. However, starting at km 60 and occurring five more times, there were markings and then a narrow road for at least 10 km. The road became so narrow that two cars could not pass each other and remain on the pavement. Instead, both would drop off onto the shoulder, kicking up clouds of dust. A bicycle and a car could pass and remain on pavement. So long as the cars weren't too "polite", I didn't eat much dust. A road train and a bicycle were more iffy and the road trains stayed on the pavement. So, usually I would stop and get off the sealed road. During the fifth narrowing of the road, this was most obnoxious both because this narrow section was 45 km long and because between ten and fifteen road trains were coming per hour. Fortunately, other sections were shorter and road trains were less frequent. I saw a 2 meter long snake that came along the road and then back to the bush. A dark head and patterned markings. Guide later said this was likely a non-venomous (mumble) python. Otherwise some cattle, but not much other wildlife along the way. I was still going strong in late afternoon, but also pleased to see Camooweal come into view. Found a motel at the edge of town. Again, a frog in the toilet (but flushable) and another one coming up the shower drain. Sunday evening, so the museum was closed, but the info center helped answer my termite, frog and snake questions. 188 km today, 8853 km cumulative. Hello Northern Territory! No speed limits here. Approximately 200,000 people in the territory, half of these live right around Darwin. Overnight kept having to evict frogs. There would be one on the wall. I'd put him out and a short time later, one on top of the toilet...Somewhat amusing. Brekky at the roadhouse and set off westward. Kept running into bugs (mouth closed!) as I crossed some low trees, but then came into open grassland. For most of the first 100 km, wide open prairies with few trees in sight. Road widened out after 7 km and at 13 km crossed the border to the NT. Yeah! Original plan for today was to stop at Soudan rest area (136 km) with my backup being the Wunara store (168 km). Nice cycling across the open plains, though noticed that tread from my front tire is mostly gone and I'll need to use the spare tire soon. Came to the Avon Downs police station at 70 km. Opposite the station, was a rest area with water tank and sortof a toilet. No camping allowed. Talked with caravaners from Victoria and filled my Camelbak even though I expected water at Wunara 98 km from here. Most of the caravaners give a friendly wave as they see cyclists. Most I talked with fit the profile of slightly older people traveling for a few months and getting out of the cold down south. About 50 km past Avon Downs was the Soudan station and 15 km past that was the rest area. Open plains were replaced by short shrubs. As I expected, the water bore at the rest area was dry/broken. It was a bit hot and with plenty of flies, so decided to continue another 32 km to Wunara. Along the way were some gentle climbs and descents. Mostly crosswinds, though the shrubs blocked much of the wind. Some caravaners passed, "do you want water?" I declined since I knew I was getting close to the store. As I came to 168 km, was eagerly looking for the store. Saw a building with no activity/cars and a white barrel scribbled with brown aboriginal letters. No other signs. It didn't look like a store, so figured I would soon find it over the next hill. Nope. Went about 10 km and realized that the structure might have been the store. Now time for plan C. It was getting late in the afternoon and the next water would be at the km 221 rest area. Wasn't clear I could get there by dark, but set off since it was getting cooler. Continued through low shrubs with many areas burned. However, mostly head down riding into the setting sun. I had been watching road markers in NT count down from 430...420...and expected the 230 marker and then the rest area. Missed both 250 and 240. Sunset came at 5:50pm and started to get dark surprisingly quick after that. Didn't know how far still and realized I wasn't going to make it by dark and found a place besides the road. The slashers (mowers) had cleared a 10m wide strip on each side, so set my tent on the edge of this grassy area and my bicycle leaning against a concrete culvert in the road. Long day. 215 km today, 9068 km cumulative. Short ride and easy day today. Overnight, I could hear road trains come blasting past and feel the gust on the tent. Particularly a concentration of road trains around 10pm. Bright out with almost a full moon. In the morning before departure, I took care of one item I'd been planning for a while. I had with me a beeper we'd last used for Y2K festivities. My intention had been to drop it somewhere appropriate to mark the start of the trip and symbolize the absence of such "on call" worries from the world. I took the pager out and chucked it into the culvert halfway under the road. Hooray! Gathered my gear and cycled off. Wow, didn't realize I was only 6 km from the rest area, otherwise might have tried yesterday. 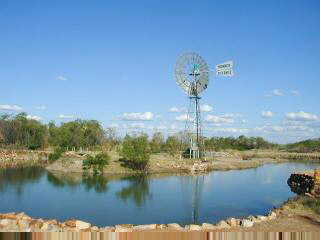 Approximately fifteen caravans parked around a windmill, water tank and small pond. Filled up on water and talked briefly with a gentleman from Tasmania. Riding north for two months to get out of the winter. Left rest area and came through an area with many shrubs and small trees. Gentle climb, I hope, and was at Barkly Roadhouse by mid-morning. 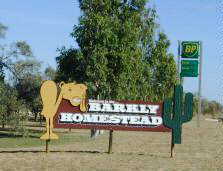 Roadhouse has bar, restaurant, ten motel rooms, camping area and caravan park. Gasoline is $AUS 1.22/liter, approximately 45% higher than what I saw in Brisbane. Looked around things and relaxed for the day. 47 km today, 9115 km cumulative. Today a day with little change in scenery. Biggest difference for the road was a 30 degree bend after 90 km. With exception of two other small bends, otherwise perfectly straight and almost flat. Usually enough trees and shrubs to prevent views very far from the road. Also a few areas that had burned. Signs say, "we like our lizards frilled, not grilled". Saw two of the frilled lizards dart onto the road, one with frills out to look larger and more menacing. Also saw plenty of burned areas. Looks like fire can quickly spread here through dry grass. Birds but not much other wildlife today. Also, no road kill today. Brekky at the roadhouse. About 35 caravans had parked overnight (@ $AUS 21 each). Multiple road trains also parked. Regular oasis along the way. Calm as I cycled the first 53 km to the first rest area, but then a strong cross wind and occasional head wind. Fortunately, at 90 km, the road turned and shifted more with the wind. Mind was going through different thoughts to keep entertained on the similar landscapes and straight road. Ready for a break when I saw the second rest area. There was a water tank and reasonable place to camp. Caravaners have been telling me their cyclist stories and particularly the Japanese cyclist story. Typically, said cyclist didn't speak a word of English and would cycle heroic distances carrying little in way of water or other items. I have yet to meet Japanese cyclists, but these caravaners all have met one "a few years ago". Stopping early gave me a good choice of location at the rest area, chance to read and relax. Also met the first touring cyclist on this stretch. 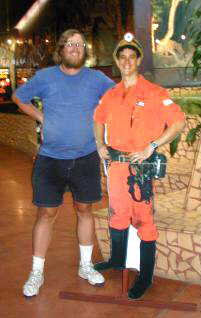 He was three days behind me in Townsville and had now caught up. He was cycling heroic distances and was French. He left Melbourne the same day I left Sydney, though also rode the bus from Rockhampton to Bowen after bike troubles. Was going to Darwin by 22nd of June and then to Thailand. In a few years, will have to embellish this to make my, "French cyclist story" :-). Pitched my tent in a quiet spot on flat concrete next to a table. After dark, four people arrived in a campervan. Two British and two Austrian who had met up in a hostel when the British had some sort of breakdown and loss of their van. Together they were now heading to the East Coast. Nice folks, though they did pitch their tents right next to mine and spent half the night talking. 113 km today, 9228 km cumulative. Beautiful moonrise last night and a pretty moon this morning. Cool temperatures and straight flat road made for a quick energetic morning ride. More bugs out, mouth closed! Slow change in trees, saw a few boab trees. Also some areas where shrubs were either dormant or dead. Grey birds with bright pink coloring would fly alongside. Slight hills and on tops of a few hills were radio repeater towers. This area went through aboriginal land grant areas, though it was tough to tell other than on the map. I'm still figuring out the situation concerning aboriginals and Australia. Australia had a violent history between European settlers and aborigines. Most recently, large areas have been granted to different tribes. These grants include mineral or tourist rights and have caused some backlash. There are some aboriginal communities in this area. There is also a big push on for "reconciliation" and acknowledgement of the past. This site can probably better explain some of the issues involved. Passed one or two rock outcroppings and was almost to the Three Ways junction. As I got near, lots of smoke in the sky from bush fires. Fortunately, not too much wind. Came to the road junction and roadhouse by mid-morning, my French compatriot shortly thereafter. This roadhouse was less fancy than Barkley Homestead, but still a nice place to relax. In the afternoon, took care of maintenance tasks after 9300 km on the road. After ~4.5 million revolutions, the tread on my front tire was worn out and threads underneath were showing along half the circumference. Laptop disk got corrupted and so needed to reinstall W2K. The mural on wall above left was painted by two signwriters based in Darwin from a photograph taken by Alan Jenkins (Alan sent me email). 70 km today, 9298 km cumulative. One ball and one strike in the repair operations. Front tire replaced fine, though had to remove the fender to make it fit and there is a slight bobble where the tire had been twisted. I still have a foldable spare, though those sometimes pop off, particularly in hot temperatures. So will feel more secure when I can pick up a new tire in Katherine, 510 kms from here. Ball one. Laptop surgery less successful. Norton Disk Doctor shows corrupt sectors, but also crashed when writing a report. NDD doesn't run under W2K, but could be run from the CD. Reinstalling W2K seems to result in system files being placed on bad disk segments. Will try some more when I have further time, or get a new hard disk. Strike one. Web pages and pictures are all on separate removable disk, though taking pictures at lower resolution for now (640x480) so I can get 331 pictures in the camera without needing the laptop. (Before I was taking at 1600x1200 resolution and reducing that resolution for the web). Scenic views and variety returned for todays ride. Very gentle ups and downs with hilltops approximately 5 - 10 km apart. I'd cycle long distance in higher gear and then shift back to climb the next hill. From tops of the hills, could see across larger expanses. Also, some rock outcroppings along the way. Terrain leaving Three Ways was slightly downhill. Quite a bit of burned bush at first. First water stop was at Attack Creek at 48 km. There was a memorial dedicated to the 1860 Stuart expedition that got to that point in crossing Australia before turning back. After the rest area, signs said "Churchill Head Rock; Old Stuart Highway". The road looked smooth and I was intrigued to see a rock shaped like the wartime prime minister, so off I set on the smaller road. No other signs, so I rode for 10 km scanning sides of the roads for rocks in the shape of Winston Churchill. Finally reached it, though the person who named the rock must either have had a good imagination or some rum. On picture at right, the stick is Churchills cigar. After rejoining the road, came through some open areas and met with a German cyclist heading from Darwin to Melbourne. He'd had afternoon tailwinds the past few days. This was close to the Banka Banka Station. Also in the area were signs indicating a World War Two staging area. Troops were taken by train to Alice and then driven to Darwin. Banka Banka staging area was one of the stops. From Banka Banka a few more hills to wind through and then back to the Desert Pub at Renner Springs. Looks like not much other than a pub/petrol/hotel/motel/caravan park. The pub was created in 1952 from a surplus WW2 hut that had been in the Banka Banka area. 136 km today, 9434 km cumulative. Tailwinds! The French cyclist and I were watching the windmill at Renner Springs spin in the early morning as we waited for the roadhouse to open. Nice feeling knowing that there was already a tailwind this early. We had spent the past three nights at the same stops. Talked in a mixture of English, French and hand gestures about politics, Australia, France, USA and variety of other things, though never got around to introducing each other by name. Nice riding from Renner Springs with a few slight hills. Shrubs and a few trees again. Followed a slight ridge for a while, so could see some distance to both left and right. Many of the stations in the area have names containing the word "downs". The landscapes reminded some settlers of Scotland. Originally many of the stations had sheep, but this shifted more to cattle as they found cows could better cope with the dry season. Each year, cattle would be driven long distances to market. Today passed a turnoff for the Barkly Stock route, one of those routes taken by drovers. Saw more standing water today in the creeks than over the past week. 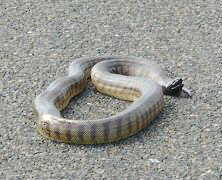 Approximately 40 km into the ride, saw a large injured snake on the road. Recent road kill. A truck had stopped and a man was getting an axe to finish off the snake and get it off the road. Reached Elliott at 90 km before noon. Still a good tailwind, but decided to stop in the first town (population 600!) since Camooweal. The French cyclist continued in order to take advantage of the wind, so we bid au revoir. Elliott seemed like a strange town. Folks in the shops were white, though most on the street were aboriginal or obvious tourists. Bars on some windows and gates around some businesses. Saturday afternoon, so had to get things early before the supermarket closed. At lunch, I noticed a newspaper mentioning it was a holiday weekend. On inquiry, found out that Monday is a holiday for the Queen's Birthday. After my question, when they brought out my bacon and egg sandwich, they placed a small Australian flag on top. 62 tires on a triple road train and also six spares carried. 92 km today, 9526 km cumulative. Lots of historical sights and landscape change as I passed from "Red Center" to "Top End" parts of the Northern Territory. Peaceful riding northwards from Elliott in early morning. Still low shrubs with occasional open areas. Took a quick stop at rest area after 25 km. Here was a water tank and also informative boards about the area. Decided to skip Newcastle Waters ghost town, about 3 km off route and continued northwards. Around 40 km was George Redmond Crossing and a large change in geology and plants. Prior to the crossing, low shrubs and wide views. The crossing itself was grassland and a large herd of cattle and some water holes. After the crossing came several changes. Soils were less red. Saw different types of trees, higher and less shrub-like. Also some slightly different grasses. A few more termite mounds. Saw more animals today, including the first geese in a while. These changes were also some of those marking a change to "Top End". Around 65 km was a historic marker with obelisk to mark completion of the overland telegraph line in 1872, barely a decade after the continent was crossed from south to north. Route to Daly Waters continued through tropical forest. Trees were taller and could occasionally cast shadows on the road. A brief stop at the Hi-Way Inn at 145 km before continuing on. Turnoff to Daly Waters was 4 km later. On the way into town, stopped briefly at the historic aerodome. Originally established in late 1920s when it was expected the rail line would extend south from Darwin. Rail line didn't quite make it, but airport served important stopover roles as well as during WW2. Gradually, longer range aircraft made the airport obsolete and was finally closed in 1971. Prior to Daly Waters was Stuart Tree where Stuart supposedly carved an "S" in 1862 and then the Daly Waters Pub. Interesting pub dating back to 1930 (oldest continuously operating pub in NT). Lots of momentos on the walls from prior visitors...stickers, flags, library cards, bras, etc. Leaned my bike outside and went inside for a room, "no Cannondales parked there! "...saw a person heckling me with a Cannondale shirt. A Queenslander from the Gold Coast. Wasn't cycling now, instead working on a "road test" project. He was part of a crew that was taking vibration/visual measurements every 50m for ~300 km for later analysis. Also saw the French cyclist. He'd reached Daly Waters yesterday and then taken a rest day. 152 km today, 9678 km cumulative.